For the last two weeks, we’ve been confronted by a period of really cold weather. For instance, on Friday, our high was -18! And the low? -40 F and that’s temperature, not windchill. So everything takes extra time. It’s taking over an hour to water the cows, horses, and donkeys. Not that they actually drink that much but it’s the get the generator to start first (it’s in the barn but still pretty darned cold), then it’s hook up the hoses and pray water will come out. Okay, then you put the end in a stock tank, walk up the hill to the barn and plug in the well pump. Then it’s walk back down to the stock tanks and stand and wait until everyone in that lot has had a good drink but not knocked the hose out of the tank. Yes, it is cold, just standing there! Especially if there’s a wind. Then when one lot has had their drinks and there’s some water left in the tank for drinks later on, you move on to the next and finally the next. All done? Nope, then you walk back up to the barn and unplug the pump, shut off the generator and begin draining the hoses very carefully. If there’s a tiny bit of water in it, you can bet it’ll freeze and tomorrow when it’s even colder, you’ll have to drag 100 feet of hose all the way to the house to thaw it out in the living room. Not fun! So we drain it twice, just to make sure. Then it’s back to the barn and shove the frost free hydrant’s handle down to drain that so it doesn’t freeze. And finally, back to the four wheeler for the ride up to the house. When it’s terribly cold, Will gets things started then drives the four wheeler up to the house and I take over for the last half. Ah, does spring ever sound good right about now! 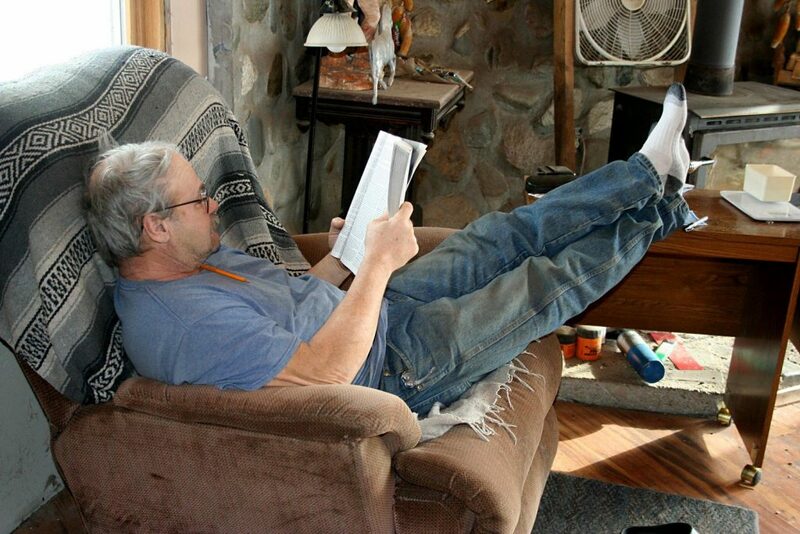 Will relaxes while poring through the Seed Saver’s Yearbook for new varieties to try this year. 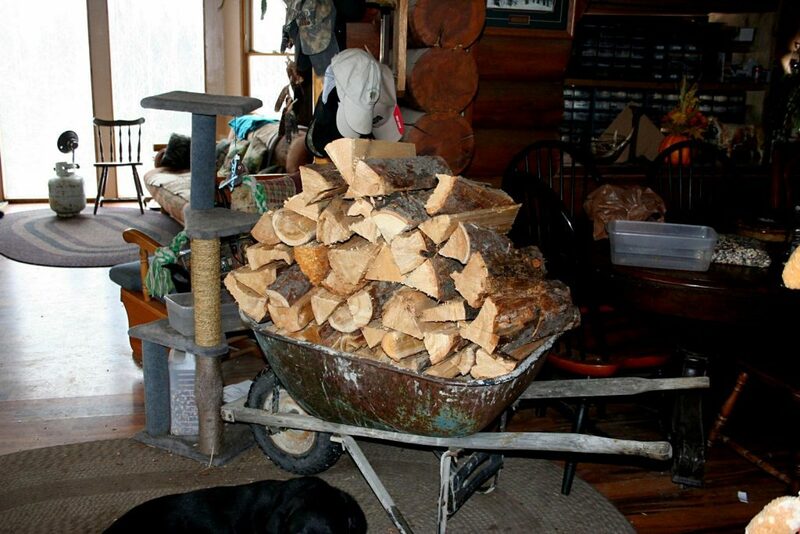 Here’s the wheelbarrow load of firewood for today and tonight. What a nice feeling to have it real handy! With all the cold, you can bet we’ve been busy with our wood stoves. Will fills our wood box by the living room stove then takes the wheelbarrow out and fills that, parking it on the rug between the entryway and dining room. As I’m keeping the kitchen range going, we do use more wood. 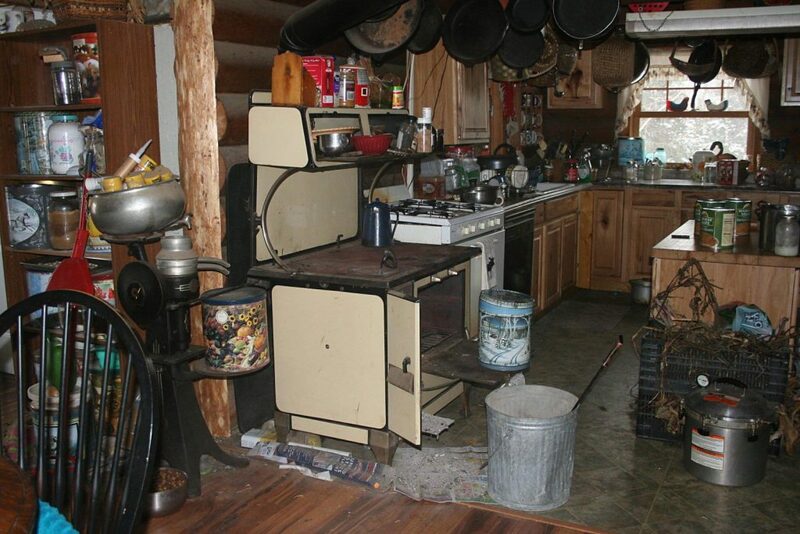 And both stoves also must be cleaned of ash periodically — more often in super-cold weather. Today I did the kitchen range as it was full of ash. I cleaned out the ash from the kitchen range today — messy job! I’ve got more refried beans to re-can up and the kitchen range’s even heat is perfect to heat up those beans, which have water added to make them to make them safe to can plus spices, onions, and garlic as they are pretty bland. So you can guess what I’ll be up to tomorrow! Thinking of you guys and praying big prayers! Spring is on the way! Fog, fog and more fog here on western Vancouver Island. What I’d give for a little sun! Our temps are around 5C, so not cold. I miss snowy winters sometimes. I totally understand the sun-deprivation! Finally we’re having days of sun and even though it’s frigid, it’s still nice to have it out. Good to see you are staying warm. Nice to know you don’t have to rely on the whims of the power companies and your heat is your own. I’ve been fortunate with the water situation as the cattle have a stream that doesn’t freeze and I have a heated waterer for the chickens. I too have been studying the SSE book and seed catalogs. I didn’t get your catalog yet and look forward to it. Has your seed catalog been mailed yet? Our new catalogs are due to be mailed on Feb. 1st. Pretty soon now! Yea! We had a couple of minor glitches that slowed down things for us in getting it printed earlier. We had our 40 below a couple weeks ago with highs below -30 for three days so I know how it goes. We only have chickens to keep thawed now. Back in the winter of 1989 I was herdsman on a dairy up in Delta Jct Alaska when we had temperatures below -65! The bosses house even had the #1 fuel gel in the line to the monitor heater in his house. Not to mention what it took to get the manure out of the barn. Keep warm! You know what we’re going through now, then, Howard. Yesterday we were at -25 for a high and windchill last night -60. But really not so bad. But I’ll sure be glad to see it warm up some. Even zero will be T shirt weather!!! Back when we lived down at Sturgeon Lake, MN, we had -55 and a blizzard that piled snow up so high that when the wind quit the TV warned snowmobilers not to run next to the power lines as they were getting electrocuted! Honestly the drifts were THAT high. The county had to bring in front end loaders and dump trucks to shovel the snow out of the roads. It was too much for the plows. So having been through that, this doesn’t seem bad at all! Is the cream separator for decoration or does it actually work? We bought it, thinking to use it. But the separator cones are too badly rusted. So this spring it goes onto the porch for country decor. Ok, Jackie, start to finish, and don’t leave anything out, please tell me again how you can the thinned beans. Pretend I don’t know how to can. Where did you get the beans, had you canned them before or were they from the store? What is the consistency are you looking for? I really want to do it too. Sorry it’s so cold at your house. We really aren’t getting a cold winter. 66 degrees today, 70 degrees on Wednesday. Hopefully rain coming at the end of the week. It was even in the 60’s over Christmas. Hope we get a little of that cold down here in Southern Ca. to at least kill some of the bugs for next garden season. Sure thing, Barbara! These vegetarian refried beans came in #10 cans I had been given by a friend; two cases or 12 cans, as she didn’t like them. So I scoop out two cans of thickened beans, into a turkey roaster in which I have melted 2 cups of lard with cracklins. (Plain lard will do; it’s for flavor.) Then I added a quart of water and used a potato masher to mix everything up to the consistency of say, Campbell’s Pork and Beans, so it would be safe to can; not too dense a product for the processing heat to penetrate. Then I added finely chopped onion and minced garlic as well as chile powder to taste as it warmed on the wood range. Once the flavor was right, I popped the pan into the oven, set at 300 degrees F. When the beans were boiling hot, I quickly packed them into pint jars, leaving 1″ of headspace. I wiped the rims of the jars clean and placed hot, previously simmered lids on the jars and tightened the rings firmly tight. I processed the jars at 12 pounds pressure (I live at 1,400 feet elevation; if you live below 1,000 feet, 10 pounds is plenty.) for 75 minutes. I turned off the heat and let the canner return to zero pressure. Then I removed the weight on the canner and removed the lid. I removed the jars and set them on a dry folded bath towel and let them cool over night. Today I’m making sure all have sealed then removing the rings and washing the jars in warm, soapy water and drying them. They are now ready to put in the pantry. Wow, snow so far south? Whew! I hope it didn’t get as bad as forecast. Love your kitchen is a work place not a show place. I hate the fancy “perfect” kitchens which obviously are seldom used for food prep. That said, your kitchen is also very attractive and looks to be a very convenient work place. I love how you said that, LeeAnn! My kitchen IS my work place and seldom looks “nice”, which would sure be nice at least once in awhile!!! But it was built for self-reliant living and is the center of all our food preparation as well as seed-saving. So it SELDOM looks like Martha Stewart visits here.